I don’t know how a company can apply for a patent for matching content supply with search demand but apparently Demand Media has applied for just such a patent. A physical computing device receives information regarding a total number of people who are searching on the search term. Information is received regarding an amount advertisers pay for the search term. Information is received regarding a click through rate of the search term. A traffic estimate of the search term is determined. Longevity of the search term is determined. 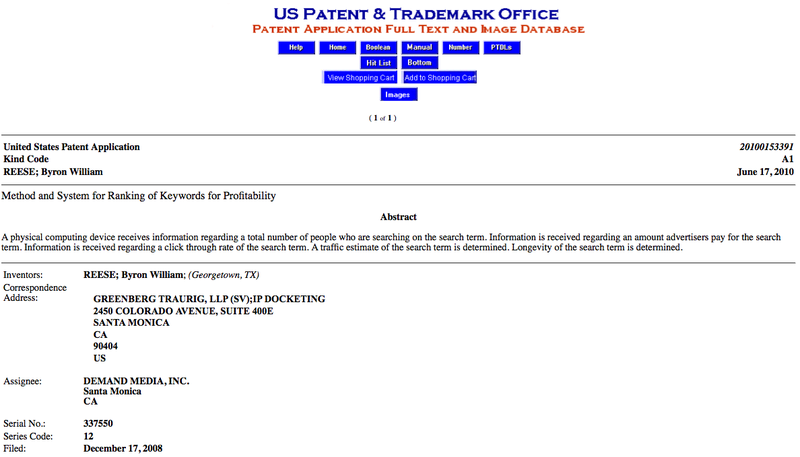 This entry was posted on February 8, 2011 at 4:59 pm and is filed under Content Supply, Demand Media, Method and System for Ranking of Keywords for Profitability, Search Demand, Search Patent. You can follow any responses to this entry through the RSS 2.0 feed. You can leave a response, or trackback from your own site.